Undoubtedly, WordPress is the most comprehensive CMS platform these days, but due to having some limitations WordPress comes with the plugins to resolve those issues. Creating tables is one of the complex issues of WordPress because by default users can’t create any table without row coding. In this case, the plugin comes into existence to resolve the issue. There are tons of table plugins in the WordPress directory which makes the users more complicated & confused about creating the table. Among them, Ninja Tables and TablePress are most advanced table plugins. Today, I am going to demonstrate a comparative view between the two most highly rated and fast-growing plugin in WordPress. TablePress is a great WordPress plugin that helps users to create and add tables to their WordPress posts. Even though it looks similar to Ninja Tables, in reality, they are two different plugins that accord a few common functionalities. Ninja Tables plugin is the fast-growing table plugin in the WordPress directory. The table below summarizes some of their key similarities and differences. Here, I am using Ninja Tables plugin to create this interactive dynamic comparison table. The interface is a vital part of any kind of tool. There are two types of interface of in general. One is table interface which has already been created by the respective plugin and another one is the plugin interface which determines how much easier or harder to operate the plugin. On the other hand, tables created by TablePress seems a little bit bulky. There are some issues that actually necessarily not needed in the interface which makes bit confused to the users. Let’s come to the plugin interface. This is the very crucial part which makes the users more interactive. The easier the interface the more you get the interaction. If someone doesn’t feel comfortable using any particular plugin then it would be a tough task to manage a table by that particular person. Ninja Tables comes with an easy to use interface which a novice user can easily operate. One functionality is separated from other 0ne, users can easily manage the plugin using any kind of table. Here is the look of a customized view of a table which shows the plugin interface very user-friendly. On the other hand, the interface of TablePress is messy as it seems like a bunch of ingredients in a small room. In comparison, it’s not that handy to manage any table using TablePress as it’s a way more complicated to operate. Here is the look of a customized view of a table which shows the plugin interface very untidy. This is how the plugin interface is created and it looks so much complicated one. Ninja Tables comes with a bunch of handy options for its users. Every functionality is segmented from each other for making the things easy. For instance, for designing and configuring any table, the plugin categorize its functions by segmentation. You can have Table Configuration tab for configuring any specific part of the table and you can have Table Design tab for styling any table of a specific part of the table. Here is a screenshot of the table interface for your better understanding. On the other hand, in TablePress you can’t have such segmented options. There are lots of options on a single page which makes thing complicated for its users. 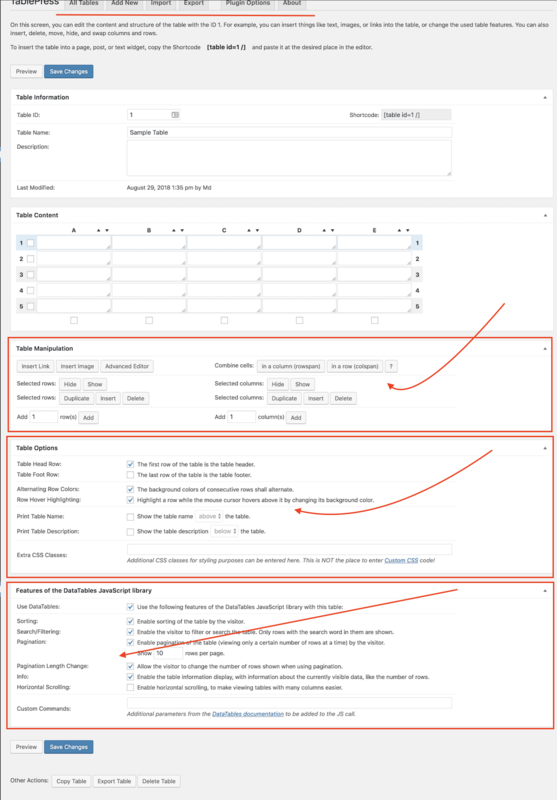 There is nothing like anything segmented options for designing and configuring rather it bears a complicated interface compared to the Ninja Tables. Here is the look of the generic interface of the TablePress plugin. Both plugins’ user interfaces follow the stylings of the core WordPress UI. This indicates the back-end pages of both plugins mingle smoothly into the rest of the WordPress admin dashboard area, making them feel like a core part of your website. Ninja Tables gives you a great styling option in a simple way. It’s a handy way to manage your table through styling. Here is the look of different styling ways of Ninja Tables. In TablePress, there is no segmented option at all. There is an option of styling along with other functionalities. Ninja Tables bears a responsive breakpoint facility which ultimately gives a full responsive outlook in the table. Users can choose any specific column to be displayed on any specific devices according to their choice. This is a smart way to deal with all the table data in different devices. TablePress doesn’t have that responsive breakpoint facility rather it’s not fully responsive and mobile friendly in type. 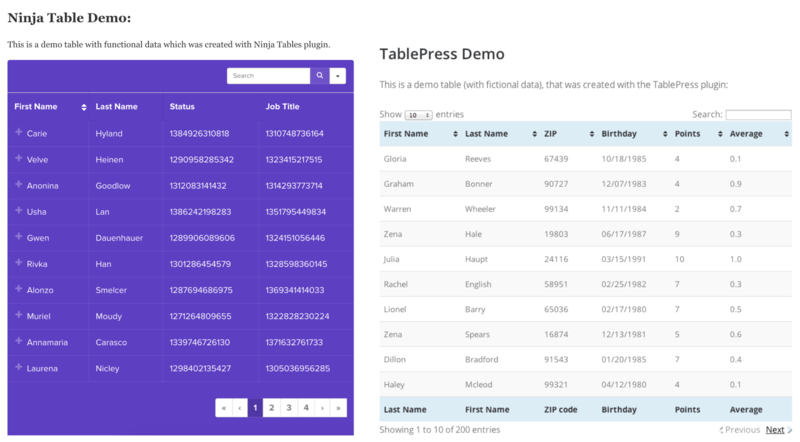 If you are using TablePress plugin, the good news is that you can easily migrate your existing data into Ninja Tables within a short possible time. Here are two screenshots have given for your better understanding. If you want to know more about data migration, you can have by clicking here. On the other hand, TablePress doesn’t have any data migration facility from other tables. One thing should be kept in mind that when TablePress came into the market it was named by WP-Table Reloaded and it has happened almost 10 years before. Then in 20013, WP-Table Reloaded replaced by the name of TablePress. At that time it was the leading plugin in the market. And most importantly, since it’s been encompassing for so long, it has acquired a massive download and active installation count. It was like scoring goals without having any player on the field. As time passes on, however, it’s no longer the best tool because it fails to keep up with the latest requirements and add new features to make the plugin more comprehensive and user-friendly. Though it’s still on the market, it loses the popularity as it was. On the other hand, Ninja Tables continues to grow in demand because it offers competitive features, better support, and an exceptional overall user experience for its users. Users find the plugin more easy to use than that of TablePress do offer. After a close discussion there you have the comparison of Ninja Tables and TablePress, It seems that Ninja Tables coming out as the obvious winner. In fine, I would highly recommend everyone to use Ninja Tables plugin for serving your purposes. Ninja Tables plugin allows you to have a responsive breakdown facility for having a better tabular look on your site. In this regard, I would place the TablePress in the second position. Hence, what are you looking for? Start with the most powerful Table Plugin from now. If you have any opinion regarding the issue, let me know by commenting below. I hope the article helped you so much to mitigate your confusion. Nice informative Post! That part was super awesome that says- ‘It was like scoring goals without having any player on the field’. I am a great fan of the plugin, this is the fast-growing quality plugin so far. Thank for helping people with the information. Pedro thanks too for reaching out! It’s lovely that you found the article helpful. I’ve been using Tablepress and find the backend input to be very unpredictable to what a appears on screen. I have one table that is clearly a sloppy patch job as I have multiple #colspan# and redundant columns so I could space everything properly. I admit to ignorance of the plugin, but it took a long time just to get that done. Resizing cells should be easier. I do have to say though that the tables displayed responsive. I’m going to try Ninja Tables now. Thanks for reaching out, Philip. It’s a warm welcome to the world of Ninja Tables! Hope, you would able to add proper value in serving your purpose with Ninja Tables. Sorry to hear that, Aaron. Thanks anyway for stopping by. I’m impressed, I have to say. Really hardly ever do I face a blog that’s both educative and enjoyable, and without a doubt, you have struck the toenail on the top. Your idea is fantastic; the problem is something that insufficient people are speaking intelligently about. I am happy that I found this in my own seek out something concerning this. me to go to see this web page, it contains helpful Information. Thanks, Rashed. That’s very kind of you! Ahaa, its good dialogue on the topic of this piece of writing here at this web site, I have read all that, so now me also commenting here. Nice post. I learn something new and challenging on blogs I stumbleupon every day. It will always be helpful to read articles from other writers and use something from their sites.